Lutein is a type of carotenoid (carotenoids function as Antioxidants in the body and are plant pigments which get you bright yellow, orange and red colours in fruits and vegetables) which is of utmost importance for eye health. There is a very strong evidence that lutein protects against macular degeneration and cataract. If you are eating a diet which makes up for at least 2 to 3 different varieties of fruits and 4 to 5 different varieties of veggies daily, you are sure to not miss out on lutein. Lutein is mainly found in the human eye in retina and macula. 1. It helps to filter the blue light, a part of sunlight, which is harmful for retina (macula) - a part of human eye. Thus it prevents macular degeneration and blindness. 2. It acts as an antioxidant and helps neutralize the free radical which otherwise would damage the retina leading to cloudiness and blurred vision. 3. It helps ward off vision loss and delay age-related cataracts due to oxidation. 4. It promotes strengthening of overall tissues of the eye. 5. It also maintains health of eye cells and delay the growth of any malignant cells. More recent research also shows that lutein is an important carotenoid to boost brain, skin and heart health due to its antioxidant nature. 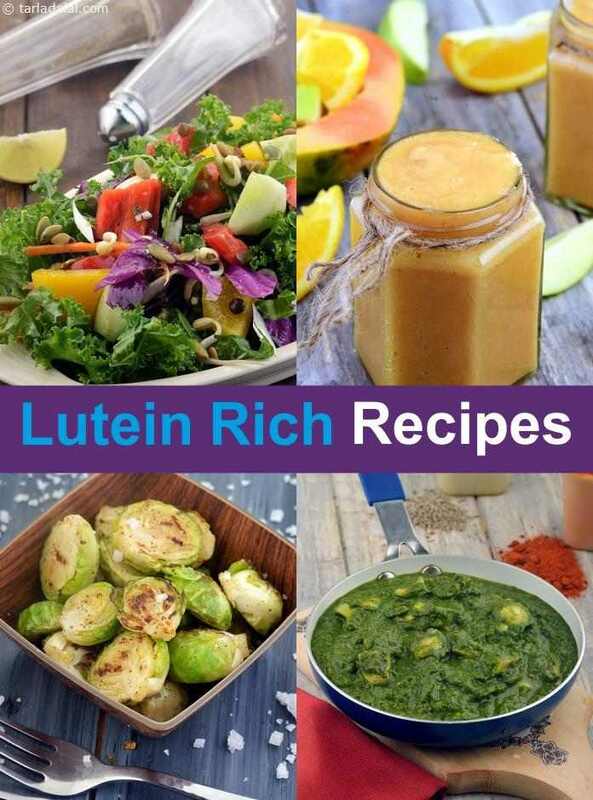 Stock your pantry with these healthy antioxidant lutein rich ingredients and try these nourishing recipes on days you have some time at hand.